When Eastlake, OH was hit by a storm a few months ago, it left a trail of fallen trees and tangled lines in its wake. As much as they’re a property bonus, trees also pose a threat to the property itself, not to mention the roof. 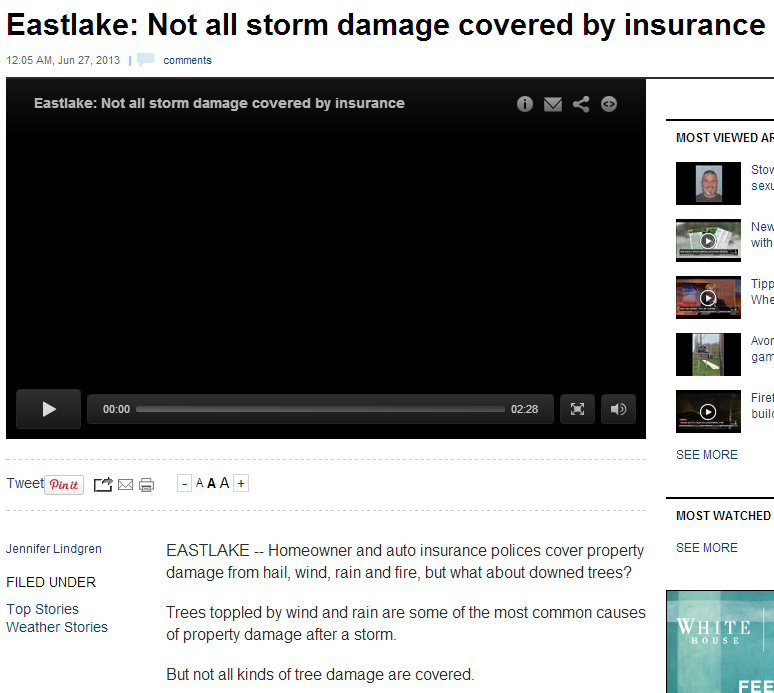 Most insurance policies, home or car, cover storm damage (part of the “Acts of God” clause in traditional insurance). However, as WKYC field reporter Jennifer Lindgren reports, not all of the storm-related wrecks are covered. Traditionally, insurance policies don’t cover damage as a result of Acts of God or events that can’t be controlled like storms (ironically, it also covers war damage). However, some Acts of God are being covered by current insurance plans in the market, making it easier for policyholders. As insurance is a big help in shouldering the cost of repairs, Concord, CA roofing companies like RoofMax often suggest getting insurance. Then again, where do fallen trees fall under? Fortunately, roofing damage caused by fallen trees are usually covered under homeowners’ insurance. Before you can start fixing the roof, however, you’ll need to get the fallen tree out of the way, which is covered but with limitations. The California Department of Insurance limits tree removal of up to only $500 (sometimes $250), including any debris produced by the fallen tree that must be removed. You may need to discuss this with your insurance provider, namely the adjuster. Fallen trees troubled Eastlake residents, primarily due to the nature of the coverage. As with California insurance, Ohio insurance’s coverage on tree removal is limited, especially if the tree falls onto your yard. Tree removal after a storm can cost thousands, which is why the report suggests consulting an arborist to check on the tree’s health prior to storm season. Trees, for the record, are considered high risk by most insurance companies, if not all. The Federal Emergency Management Agency (FEMA) reiterates the importance of tree maintenance before a storm. Tree branches near the roof must be taken down as they can scratch or damage the roof when gale-force winds start to blow in the area. Get a reputable Concord roofing company to brace your roof for an incoming storm by patching up cracks and refilling missing slats. A tree in your yard may be a problem, but at least an unscathed roof is a financial load off your back. This entry was posted in Blog, Facts & Guides, Industry News, Press Releases, Repair & Maintenance, Roofing Contractor. Bookmark the permalink.